Managing a restaurant is no easy task, especially when your staff consists of just two people, with one behind a counter making the dishes at all times. 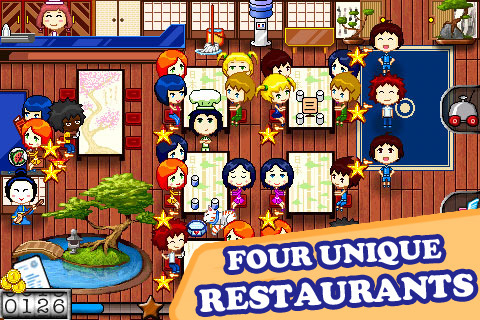 That leaves just one person, you, to be waitstaff in QubicGames’ game app, My Little Restaurant. A food-serving game like Diner Dash, My Little Restaurant features four restaurant themes: American Diner, Japanese Bar, Ancient Palace and Space Lunchroom. Customers file in from the entrance at the upper right, whereby you show them to a free table by tapping, holding, and sliding them into it. There, they are automatically given menus. Once they decide on their dish, they will put down the menus, which is your cue to come take their order. Tap their table to take their order, then tap your coworker by the counter at the top left to deposit the the order with him. Once he’s down making it, tap the covered dish to pick it up, then tap the table to deliver it (match the number on the dish to the number at the table). When the customers’ plates are empty, tap the table to clear it and be paid. You’ll have to drop the dirty dishes off to be cleaned, which of course you’ll do by tapping the counter. These are all the basic instructions on how to serve guests, but imagine doing this with four or more full tables and a line of people at the door. That’s a lot of tapping. Customers show their satisfaction (or dissatisfaction) with the service with the gold stars hanging by them. Any sign of red instead of gold means unhappiness, which means less pay for you (or at worst, no pay). There are special features and power-ups, with which you can use to slow down their annoyance; they are introduced slowly as the game proceeds through its 33 levels. There can be up to 50 guests at a time, so use them wisely, because they can come with limited use. 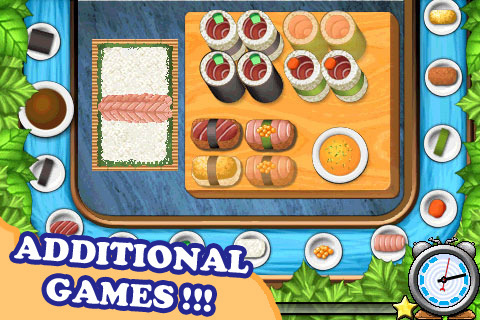 Also included are two mini-games, in which you will step into the kitchen for once. I like that there are mini-games to break up the intensity of serving 50 guests at once, but I love the graphics even more. People look like a combination between Azumanga Daioh characters and computers sprites, so the adorable is off the scale. The restaurants themselves also look great–check out those designs on the tops of the tables. I also enjoy that the music gets a chance to become part of the game as one of the special “soothe the angry customers” features; it even changes songs, just like it would in a real restaurant. While I think the name could use a little tweak (too close to My Little Pony, which is another load of baggage altogether), My Little Restaurant is a solidly entertaining food service app with a lot of potential to grow. $2.99 may seem a tad steep for a simple game like this, but it’s easy to get hooked on (and hungry), as navigating through the restaurant does actually take quite a bit of concentration. AppSafari review of My Little Restaurant was written by Julie Guan on September 8th, 2010 and categorized under Action, App Store, Featured, Food, Games, Resource Management. Page viewed 5009 times, 1 so far today. Need help on using these apps? Please read the Help Page.